The weekend is only a few days away again. 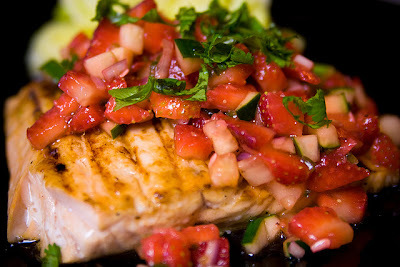 I thought I would post this recipe as it’s a great substitute for tomato salsa. It will spice up any back yard barbeque. It probably sounds, to those who have never had it, like a very odd combination, but it is not. 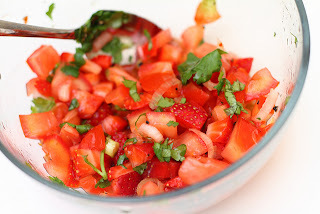 The sweetness of the strawberries goes amazingly well with the bite of the jalapenos, the lime and cilantro. The only drawback is all the chopping. It has to be small. But that’s the case for any salsa, isn’t it. Maybe someone should invent a "salsa vegetable chopping device." Or for any of you crazy enough to buy a "slap-chop" maybe it's time for it to earn its place. Our local strawberry season in Nova Scotia should start in a couple weeks, so tuck this recipe under your hat for when they’re at their ripest. 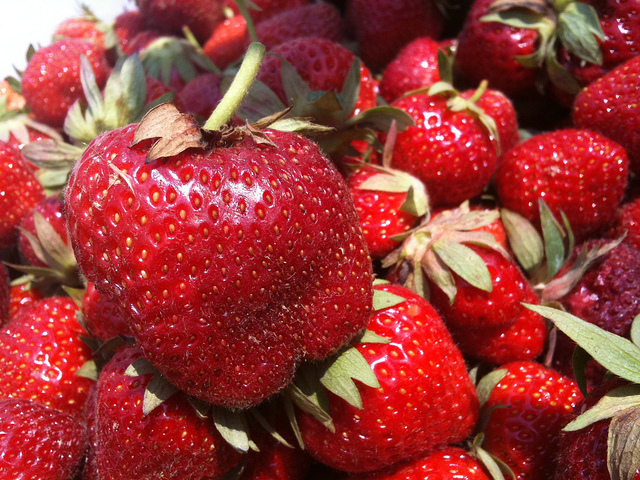 The season usually passes within 3-4 weeks, and as you know, no berries are finer than the ones you pick yourself! I also modified a Catalina Dressing recipe that I had posted earlier for inclusion in the salsa. The recipe makes about 2 cups, so you will have enough dressing for at least one salad to go with your steaks, burgers, chicken and whatever else you decide to put on the barbeque! Chop the strawberries and let drain in a sieve over a bowl for 15 minutes. Reserve the juice for the dressing. While the strawberries are draining chop the remaining ingredients. Mix all together in a bowl. adding the strawberries after they have drained. Add the Catalina dressing, salt and pepper. Toss to combine. Cover the bowl and refrigerate until chilled, at least for a few hours. * If you want hotter salsa leave the ribs in the jalapenos. I have read that round tipped jalapenos are less hot than pointy ended jalapenos, but I haven’t tested the theory. Add all the ingredients to a food processor bowl. Pulse until well blended. With the processor running, slowly add the oil in a thin stream. Check salt and pepper and adjust if desired.